January: Corvette history in the month of January. February: Corvette history in the month of February. March: Corvette history in the month of March. April: Corvette history in the month of April. May: Corvette history in the month of May. June: Corvette history in the month of June. July: Corvette history in the month of July. August: Corvette history in the month of August. September: Corvette history in the month of September. October: Corvette history in the month of October. November: Corvette history in the month of November. December: Corvette history in the month of December. Bowling Green Assembly Plant: Quick facts about the Bowling Green Corvette Assembly Plant in Bowling Green, Kentucky. Build Records: An excellent article on the existence, or lack of, Corvette build records. Chevrolet Bowtie: History of the Chevrolet bowtie emblem. Corvette Emblem: If you've ever wondered where the characteristic crossed flags Corvette emblem came from, check out our History of the Corvette Emblem article. Corvette Wave: Have you ever wondered why Corvette owners wave at one another? Here's where it all began! History - Corvette's Fiberglass Body: Excellent article describing how the Corvette came to be built in fiberglass and not steel. Owner Information Center: We've tried to build this section in order to help point you in the right direction to finding information about your Corvette and its past owner(s). It contains a compilation of links on the web leading to various sites that may be of help to you in your search for that information. You are also able to search through the Information Wanted and Available Information Listings as well as post your own advertisements. Press Release Archives: These press releases cover 1995 to the present and come from both Chevrolet and General Motors Media Archives. We chose the Press Release which we felt were the most significant in terms of historical and technical information. 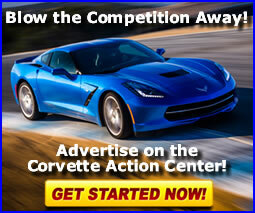 As more Corvette related press releases are released in the future, they will be included in this listing. The press release topics cover everything from new product introductions, to Corvette C5-R race results. Stop by and check them out. Carl Renner: A Chevrolet designer who is believed to have had a significant influence on the the design of the 1953 Corvette and the solid-axle Corvettes to follow. Chip Miller: A brief look at Chip Miller, one of the key organizers of the Corvettes at Carlisle event. David Hill: Corvette Chief Engineer and Vehicle Line Executive from 1992 to 2006. Harley Earl: The "Father" of the Corvette. John Cafaro: John Cafaro and Corvette: It was all by design. Larry Shinoda: Corvette Designer most known for the design of the 1963 "split-window" coupe. Myron Scott: The man responsible for naming the Corvette. Noland Adams: He wrote the book on Corvette Restoration. Zora Arkus-Duntov: Tribute: The "Godfather" and first Chief Engineer of the Corvette. Zora's Letter: This is the letter by Zora that saved the Corvette from being discontinued!